“The performance tells a mother’s story of her daughter’s struggles with drug addiction and contextualises her story with recorded interviews with other illegal substance-users, conveying a sense of what it is that drives an individual to the depths of self-destruction. 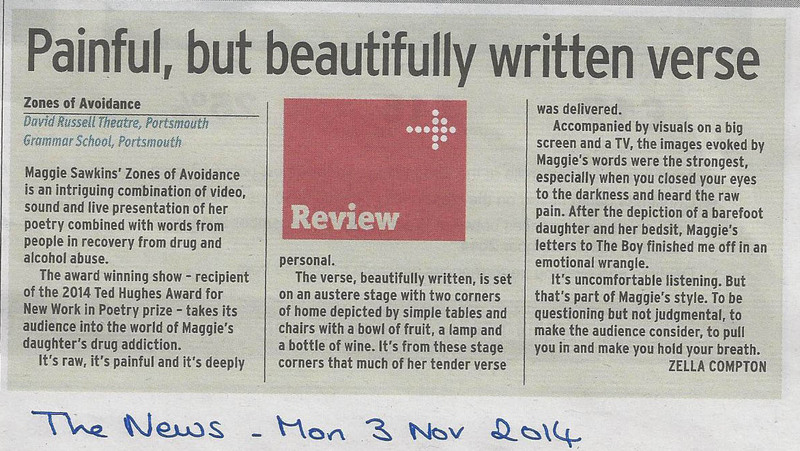 Review below in The Portsmouth News of a performance at David Russell Theatre, Portsmouth on 30 October 2014. ‘I enjoyed Maggie Sawkins’ Zones of Avoidance even more second time round, if ‘enjoyed’ is the right word for a show that left me sobbing. Though Zones of Avoidance won Maggie the 2013 Ted Hughes Award for Poetry, this is no mere poetry reading. Maggie and her director Mark C. Hewitt have woven a tapestry of words and images, telling the story of ‘Sunny Girl’ and her descent through the circles of addiction. 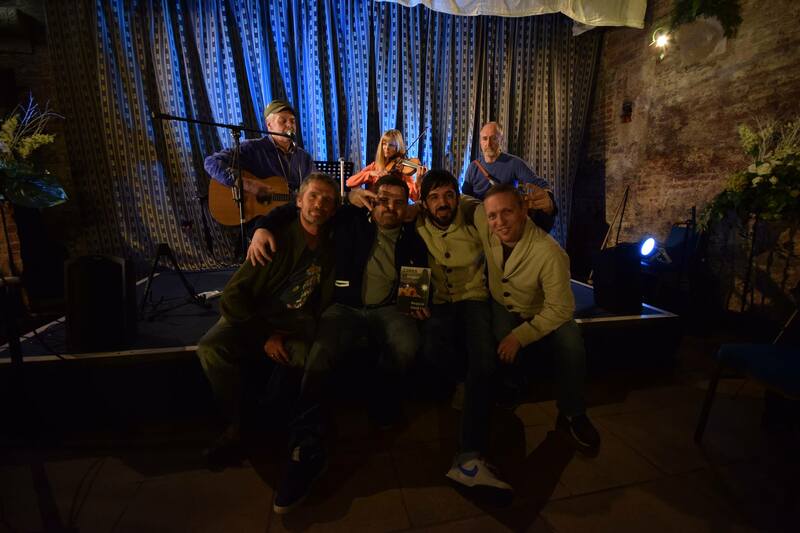 We begin with real recordings in which addicts discuss their problems with humour, articulacy and immediacy. These interviews alone are hugely affecting. Maggie’s poetry tells the story of her daughter’s struggles and how they affected her relationships, especially, in the last section, with her son. The poems, delivered sometimes live, sometimes on video, have the clearcut, hard-hitting quality of a documentary, with the shimmer of poetic illumination: moons and stars, half-moons and tides. with no coat or socks, in search of a fix. The book Zones of Avoidance was published in March 2015.